Comté Cheese from Fort St. Antoine for sale. Buy online at Zingerman's Mail Order. Gourmet Gifts. Food Gifts. 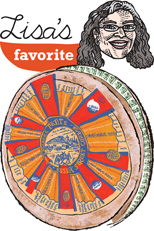 Lisa Roberts is our cheese specialist and food safety expert at Zingerman's Mail Order. Recently I travelled to Marcel Petite’s Fort St. Antoine in Jougne, France where they age Comté cheese. This was a dream come true for me. Everyone acknowledges that the French make great cheese and Comté is king in France. Comté from Fort St. Antoine is the crown of the king and a trip there is like a cheesemonger's haj. The Fort is special because it’s an ideal environment for very slow maturing of the wheels. Inside, the cheese can develop and express its individual flavors. Plus, it’s cool because it's really a fort! It was built into the side of a hill in the 1800’s and abandoned after it failed at its job stopping Germans in World War II. Before I ever visited the Fort or even knew of it, I was already a Comté convert. I love this cheese because I think it’s just about perfect. It’s a wonderful balance of flavors that include hazelnut, brothy french onion soup and butter. It has the most delicate hint of sweetness and a super long finish. Perfecto! Consistently delicious. One of the most complex and fulfilling cheeses you can buy, it eats like a meal. Our current wheel was made in December 2017. It has a a light, floral flavor that emphasizes the brighter end of the Comté spectrum.
" ...looks like silk and dissolves smoothly on the tongue." "The best comté I've tasted."